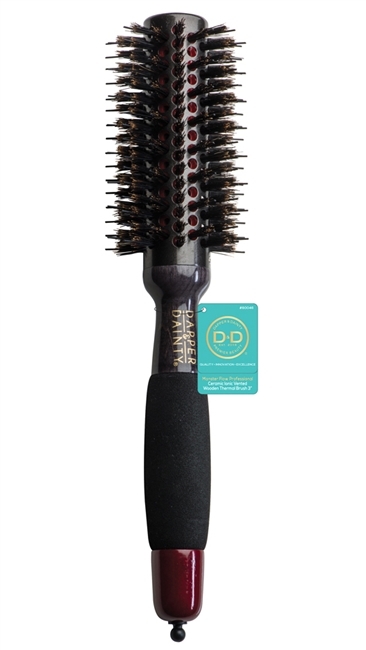 Patented technology gives these brushes a leg up when it comes to drying hair faster. Not only do they feature a ceramic barrel that heats up to help dry the hair, but they come armed with two types of bristles to ensure the most effective way to dry hair while maintaining it's health. Achieve the voluminous look you've always wanted with these gorgeously designed brushes. Ceramic coated barrels ensure even heat conduction and reduce damage while porcupine bristles condition and detangle. The nylon bristles feature an ionic property to help decrease drying time and promote the hair's moisture retention and circulation of airflow, leaving hair shiny and smooth. Patented technology gives these brushes a leg up when it comes to drying hair faster. Not only do they feature a ceramic barrel that heats up to help dry, they come armed with two types of bristles to ensure the most effective way to dry hair while maintaining it's health. D&D Professional Ceramic Ionic Thermal Brush, 2" Barrel D&D Light Oval Paddle Brush Coral Multi Nylon Bristle D&D Glossy Lux Rectangular Wooden Boar Wave Brush D&D Ergo Grip Professional Wavy Ceramic Ioni Thermal Brush, 1 1/4"